Elke Bergholz, left, watches as Joel Michalski, a NOAA scientist, prepares to release a weather balloon at the South Pole on January 17, 1999. 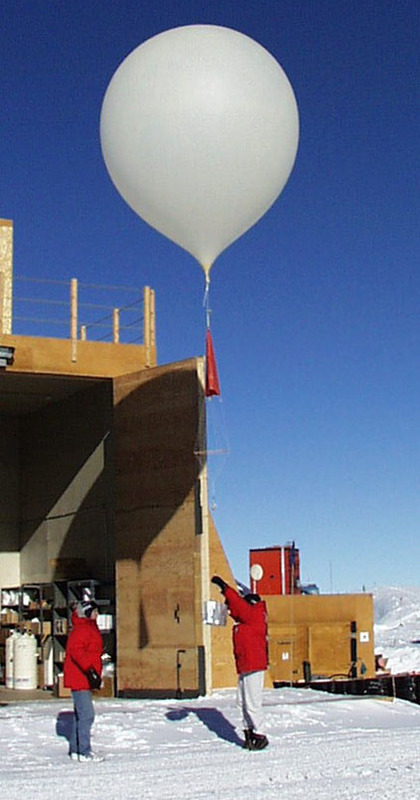 The balloon is carrying an ozonesonde, which will measure the ozone in the air as it rises more than 80,000 feet. Bergholz was a teacher at the United Nations International School in New York City who was working at NOAA South Pole Lab as part of the Teachers Experiencing Antarctica Program. Her Web journal from that day is still available online. The AMS Weather Book tells the story of the discovery of the Antarctic ozone hole and how scientists worked out what causes much of the ozone high above Antarctica to disappear when the sun comes up each Antarctic spring. The ozone builds up again during the summer, only to disappear the following spring. The Web sites and other information here are supplements to the ozone hole story on pages 281 through 286 of The AMS Weather Book. The September 1996 issue of the University Corporation for Atmospheric Research’s (UCAR) Staff Notes Monthly has an online story marking the tenth anniversary of the First National Ozone Expedition (NOZE-1), led by Susan Solomon. The AMS Weather Book’s account of NOZE-1 and its results (pages 283–286) is based in part on this story, in addition to the author’s interviews with Solomon and other accounts. The AMS Weather Book story also relied in part on a NOAA Magazine story marking the experiment’s twentieth anniversary. The story has several links to more information about ozone at the bottom. The National Science Foundation also marked the anniversary, as noted in a press release about a press conference at the National Press Club, in Washington. As related in The AMS Weather Book, at this press conference David Hofmann, director of NOAA’s Global Monitoring Division, noted research that shows the global effort to reduce the amounts of ozone-destroying substances is working. A May 4, 2006, NOAA press release describes the research showing this. The Global Monitoring Division Web site has the latest information on ozone. The University of Cambridge’s Ozone Hole Tour page is a good place to begin learning about ozone hole science. In 1995, Paul Crutzen, Mario Molina, and F. Sherwood Rowland won the Nobel Prize in Chemistry for their studies of ozone. The Nobel Prize in Chemistry 1995 Web page describes their work and has links to their autobiographies.